Consider a single slit diffraction pattern for a slit of width d. Find the value of d if the angle between the first minimum and the central maximum is 4*10-3 radians and the wavelength of the light is 633 nm. Given the wavelength of the light we can find the slit width from the diffraction pattern. A beam of monochromatic light with a wavelength of 500 nm is directed through an absorber having 5 equally narrow slits separated by 20 μm between adjacent slits. The resulting diffraction pattern is observed on a screen that is perpendicular to the direction of light and 5 m from the slits. The intensity of the central maximum is 1.3 W/m2. (a) What are the distances from the central maximum to the first and second principal maxima on the screen? (b) What will be the intensity of the central maximum if there are only 4 equally narrow slits (of the same width as in part a), separated by 20 μm between adjacent slits? We are supposed to analyze the diffraction patterns produced by several slits. sinθ = z/(z2+L2)½ ≈ z/L if L >> z.
m = 1: sinθ = 2.5*10-2, sinθ = z/L, z ≈ 12.5 cm. (b) The central intensity is proportional to the square of the number of sources. 1.3*16/25 W/m2 = 0.832 W/m2. Two gratings A and B have slit separations dA and dB, respectively. They are used with the same light source and the same observation screen. When grating A is replaced with grating B, it is observed that the first-order maximum of A is exactly replaced by the second-order maximum of B. (a) Determine the ratio dB/dA. (b) Find the next two principal maxima of grating A and the principal maxima of grating B that exactly replace them when the gratings are switched. Identify these maxima by their order numbers. Constructive interference occurs when d sinθ = nλ. a) dAsinθ = λ, dBsinθ = 2λ, dB/dA = 2.
dAsinθ = 2λ, (dB/2)sinθ = 2λ, dBsinθ = 4λ. dAsinθ = 3λ, (dB/2)sinθ = 3λ, dBsinθ = 6λ. Light of wavelength 640 nm is shone on a double-slit apparatus and the interference pattern is observed on a screen. When one of the slits is covered with a very thin sheet of plastic of index of refraction n = 1.6, the center point on the screen becomes dark. What is the minimum thickness of the plastic? Destructive interference occurs when the optical path length difference is mλ/2, with m = odd integer. The geometrical path length from each slit to the center of the diffraction pattern is the same. Let the thickness of the plastic sheet be x. The optical path length through the plastic sheet is nx and the optical path length difference is therefore (n - 1)x. We need (n - 1)x = λ/2, for the minimum thickness n.
Reaching the slits, the waves passing the slits are in phase. Upon exiting the slits they have a phase difference (k' - k)x = (2πn/λ - 2π/λ)x = (2π/λ)(n - 1)x. For the minimum thickness we need (2π/λ)(n - 1)x = π, x = λ/(2(n-1)) = λ/1.2 = 533 nm. The minimum thickness is 533 nm. Suppose light from a Helium-Neon laser (wavelength λ = 633 nm) is expanded and collimated into a beam with a diameter of 2 cm, and then split into two beams that intersect as shown in the drawing below. Let the polarization of the beam be perpendicular to the plane of the drawing. (a) If the full angle between the two overlapping beams is 10o, how many fringes appear in the overlapping region? (b) When the angle between the overlapping beams is increased to 30o, does the fringe spacing in the overlap region increase or decrease? By how much? In the regions where the beams overlap we have E = E1 + E2. The intensity is proportional to <E(r,t)2>. a) λ = 633 nm, beam diameter d = 2 cm. k1 = k2 = k = 2π/λ = 9.92*106 m-1. k1x = kcosθ, k2x = kcosθ, k1y = ksinθ, k2y = -ksinθ. In the regions where the beams overlap we have E = E1 + E2. Let E = Ek. E(r,t) = A1cos(k1∙r-ωt) + A2cos(k2∙r-ωt). E(r,t)2 = (A1cos(k1∙r-ωt))2 + (A2cos(k2∙r-ωt))2 + 2A1cos(k1∙r-ωt)A2cos(k2∙r-ωt). cos(k1∙r-ωt+k2∙r-ωt) = cos(2kcosθ x - 2ωt). The average values of cos2(k1∙r-ωt) and cos2(k2∙r-ωt) are ½, and cos(2kcosθ x - 2ωt) is zero, when averaged over a large number of periods. The intensity therefore varies with y as C1 + C2cos((2π/λ')y) = C1 + C2cos(2ksinθ y). How many λ' fit into d, the maximum width of the overlapping region? The maximum width of the overlap region is 4 cm*sinθ/sin(2θ) = 2 cm/cos(θ). The maximum number of fringes is (2 cm/cos(θ))/(π/ksinθ) = 4*tan(θ)/6.33*10-5. When θ = 5o, then λ' = 3.63*10-6 m, we observe 5529 fringes. Two radio-frequency sources, A and B, a distance 4 m apart, are radiating in phase radiation of wave length λ = 1 m. You move a detector on the circular path of radius R >> 4 m around the two sources in a plane containing them. How many maxima do you detect? We expect a "double slit" interference pattern. dsinθ = mλ, sinθ = mλ/d . Here sinθ = m/4. For 0 ≤ θ < 2π we can satisfy this condition 16 times. A monochromatic wave of wavelength λ illuminates an opaque mask with two slits as shown in the figure. The diffraction pattern is recorded on a screen a distance L from the mask. You may assume that λ << d. D << L.
(a) What is the distance Λ between adjacent interference fringes observed on the screen? (b) What is the width Δx of the central lobe of the interference pattern on the screen? The distance Λ between adjacent interference fringes is the distance between adjacent maxima of the double slit interference pattern. The width Δx of the central lobe of the interference pattern equals twice the distance from the central maximum to the first minimum of the single slit interference pattern. (a) For the distance between adjacent maxima of the double slit pattern we have Dsinθ = λ. Here sinθ ≈ θ ≈ Λ/L. So Λ = λL/D. (b) For the distance from the central maximum to the first minimum of the single slit interference pattern we have dsinθ = λ. Here sinθ ≈ θ ≈ Δx /(2L). So Δx = λ2L/d. A spy satellite travels at a distance of 50 km above Earth's surface. How large must the lens be so that it can resolve objects with a size of 2 mm and thus read a newspaper? Assume the light has a wavelength of 400 nm. Diffraction limits the resolution according to θ = 1.22 λ/D = y/L. Here the height of the object to be resolved is y and the distance to the object is L. Solving for D we find D = 12.2 m.
For an ideal telescope, the limiting resolution is the size of the Airy disk. However, turbulence in Earth's atmosphere produces pockets of denser air which refract light rays from distant stars, causing them to strike a telescope detector at slightly different locations. At sea level, this imposes an effective resolution limit of 1 arc-second (1/3600 degree) regardless of the size of the telescope. For what diameter of telescope does this represent the diffraction limit for blue light (λ = 400 nanometers)? D = (1.22*4*10-7/4.85*10-6) m = 10 cm. (a) An incident monochromatic x-ray beam with wavelength λ = 1.9 Å is reflected from the (111) plane in a 3D solid with a Bragg angle of 32o for the n = 1 reflection. Compute the distance (in Å) between adjacent (111) planes. (b) Assuming that the solid has a fcc lattice, use the result from part (a) to compute the lattice constant a (in Å). In Bragg reflection the condition for constructive interference is: nλ = 2d sinθ, where θ is the angle between the incident wave vector and the scattering planes. (a) d = λ/(2 sinθ) = 1.9 Å /(2*sin32o) = 1.79 Å is the distance between adjacent (111) planes. 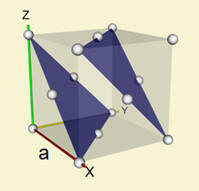 (b) From geometry: 3d = (3a2)½, a = d*√3 = 3.1 Å is the lattice constant.